My husband and I like to travel. I always take a lot of pictures and wanted a way to display some of those photos and memorabilia in mini albums. However, they needed to be fast and fun to assemble or I knew I would never get them done! So I started making postcard albums with my printable Scrap Girls supplies. First, when I’m shopping in a city or at a hotel or restaurant that has a postcard, I grab one. It’s a souvenir I don’t have to worry about packing in a suitcase. I just stick it in my purse for when I get home. Second, my husband and I email family and friends as we go from city to city, so we send a copy of the email to ourselves so we’ll have a record of our journey as well. Finally, I keep some receipts, ticket stubs, menus, and also pick up a couple of cute key chains along the way. Do fully digital layouts sized specifically to fit each card, print them out and paste them to the back of the postcards. 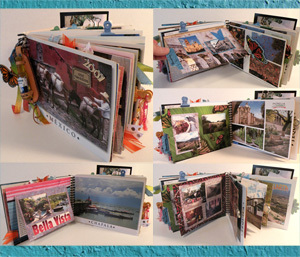 Or just print out some of my favorite photos along with papers and embellishments from a Scrap Girls collection. Then I can have some fun cutting and pasting these elements onto the cards. The printed embellishments, like printed ribbons, work great for the interior pages because they keep the album from getting too thick. If I include dimensional objects like clips and ribbons, I place them around the edges where their bulk won’t interfere with the binding. Remember those emails? I print them out and have instant journaling to put with my photos! I make all kinds of flaps and pockets for my journaling, receipts, and menus. After the album is bound, I attach the key chains to the spine for some extra special bling. Postcards and key chains – both are inexpensive and easy to carry. Coupled with photos, some emails, and your printable Scrap Girls collections, and you’ve got an easy and fun postcard mini album! This project uses products from the Touches of Mexico Collection.